To assess the environmental factors determining the zonation between Phacelurus latifolius and Phragmites australis, vegetation survey and soil analysis were performed at a tidal marsh. The vegetation of the tidal marsh was classified into P. latifolius and Suaeda japonica dominated quadrats, P. latifolius and P. australis dominated quadrats, P. australis dominated quadrats, and P. australis and other land plants dominated quadrats. The density of P. latifolius (83.7 ± 5.5 shoots m−2) was higher than that of P. australis (79.3 ± 12.1 shoots m−2) in each dominated quadrat but height of two species were similar. Soil environmental characteristics of P. latifolius dominated quadrats appeared to be affected by tide based on higher soil electric conductivity (ECPL = 1530 ± 152 μS cm−1; ECPA + PL = 689 ± 578 μS cm−1; ECPA = 689 ± 578 μS cm−1) and lower pH (pHPL = 5.96 ± 0.16; pHPA + PL = 6.28 ± 0.31; pHPA = 6.38 ± 0.22). In redundancy analysis, environmental characteristics of P. latifolius dominated quadrats and P. australis dominated quadrats were clearly separated and those of P. latifolius and P. australis co-dominated quadrats were similar to P. australis dominated quadrats. From our investigation, P. latifolius showed relatively high competitiveness when compared to P. australis in lower tidal zone rather than upper tidal zone. Zonation of P. latifolius and P. australis seems to be a transitional zone between halophytes and land plant species. Tidal marshes, showing high primary productivity, usually function as buffer zone, water purifier, and habitat for wildlife (Moeller et al. 1996; Wolters et al. 2005; Bang et al. 2018). Many ecological functions of tidal marsh are based on the growth of plant species. Since salinity and water flooding act as a selective pressure in tidal marsh, only a few plant species could inhabit in tidal marsh when compared to other types of wetland (Ihm et al. 2006; Isacch et al. 2006). Thus, adaptive mechanisms to the saline and frequently inundated soil such as salt excretion are necessary to plant species for inhabiting in tidal marsh. Due to seawater flooding regime causing heterogeneous environments in tidal marsh, zonation patterns of vegetation often occur depending on soil environments particularly in rhizosphere (Armstrong et al. 1985; Ihm et al. 2006; Bang et al. 2018). Grass species mainly occur in the temperate zone of tidal marsh (Ihm et al. 2001, 2006). In upper tidal zone, for example, common reed (Phragmites australis (Cav.) Trin. ex Steud.) is the most common and dominant species that contributes to productivity and landscape. Suaeda spp. such as Suaeda glauca (Bunge) Bunge and Suaeda japonica Makino are common halophytes, which inhabit only at lower part of tidal zone in East Asia (Lee et al. 2016). In tidal marsh of East Asia, Phacelurus latifolius (Steud.) Ohwi has also occurred with P. australis (Yokoyama et al. 2003; Min 2015). Both species show high standing crop and similar stand in tidal marsh (Lee 2003). P. latifolius is classified as halophytes, while P. australis is classified as salt-tolerant species (Lissner and Schierup 1997; Yokoyama et al. 2003). According to salinity ranges, two species have shown the zonation pattern in tidal marsh (Yokoyama et al. 2003; Bang et al. 2018). Despite different niche in the salinity range of P. latifolius and P. australis, those species occasionally co-occur in an area (Min 2015). Quantitative analyses on soil physicochemical properties are important for understanding the environmental ranges of individual species in tidal marsh. Nevertheless, only a few studies have been performed about the co-existence of P. australis and P. latifolius in tidal marsh focusing on the environmental distribution range of two species only in elevation and physical properties of soil (Yokoyama et al. 2003; Min 2015). To investigate the soil environmental factors determining the zonation between P. australis and P. latifolius in tidal marsh, distributional characteristics and soil physicochemical properties were surveyed. Field survey was conducted at a tidal marsh in the tidal channel of Siheung City, Gyeonggi Province, Republic of Korea (37° 24′ N 126° 45′ E) in July 2016, when the flowering bud of P. latifolius was emerged. Two or three quadrats in each of 11 transverse lines along the zonation of P. latifolius and P. australis were surveyed (total 31 quadrats; Fig. 1). Average height, density, and coverage of every species which emerged in the 1 m × 1 m quadrat were surveyed. Soil samples were collected in 30~40 cm depth (near the rhizosphere of P. latifolius or P. australis) at each quadrat at low tide. Soil samples were air-dried and passed through a 2-mm-mesh sieve. Soil moisture was measured by loss of mass after drying at 105 °C oven for 24 h (or 48 h), and organic matter content (OM) was calculated by the loss-on-ignition method at 550 °C furnace (Boyle 2004). Soil electric conductivity and pH were measured by the mixture of soil samples with distilled water at 1:5 ratio (conductivity meter: Corning Checkmate II, Corning, Lowell, MA; pH meter: AP63, Fisher, Hampton, USA). Soil NO3-N and NH4-N content were measured by hydrazine method and indophenol method from the extract using 2 M KCl solution at 1:5 ratio, respectively (Kamphake et al. 1967; Kim et al. 2004). Soil PO4-P content was measured by a Bray No. 1 method (Bray and Kurtz 1945) from the extract with Bray No. 1 solution. Available cations (K+, Ca2+, Na+, and Mg2+) were extracted with 1 N ammonium acetate solution (Allen et al. 1974), and contents were measured by an atomic absorption spectrophotometer (AA240FS, Varian, Palo Alto, USA). Soil particle composition, sand, silt, and clay contents were examined by hydrometer method (Carter 1993). TWINSPAN analysis for community ordination and redundancy analysis (RDA) were performed by R version 3.3.3 (R Core Team 2016) with “twinspanR” and “vegan” package, respectively. Vegetation cover was used in TWINSPAN analysis. Hellinger-transformated vegetation cover and raw soil environmental variables were used in RDA. Analysis of variance and Duncan’s post hoc test of soil environmental variables were also conducted using R with “agricolae” package. Phacelurus latifolius dominated quadrats were distributed in the relatively lower part of the tidal marsh than P. australis dominated quadrats. P. latifolius and P. australis co-dominated quadrats by two species were distributed between dominated areas of each two species. Average shoot height of P. latifolius and P. australis was similar as about 150 cm (Fig. 2a). Those two species grew about 2 m at the end of the growing season. Average density was slightly higher in P. latifolius dominated quadrats (Fig. 2b). In P. latifolius and P. australis dominated quadrats, density of two species was relatively low, while average height of each species was similar to the each dominated quadrat. As a result of TWINSPAN ordination, quadrats were classified into P. latifolius and Suaeda japonica community and other communities with P. australis (Fig. 2c). Major co-occurred species with P. australis was P. latifolius or Erigeron annuus (L.) Pers. (daisy fleabane), mainly occurs in land ecosystem (Lee 2003). Species composition of P. australis and E. annuus community or P. australis and other species community were similar to the terrestrial ecosystem rather than tidal marsh. In proximity to the seawater, physicochemical properties of P. latifolius dominated quadrats were similar to the seawater rather than P. australis dominated and P. latifolius and P. australis dominated quadrats. P. latifolius dominated quadrats had the highest electric conductivity (1530 ± 152 μS cm−1) and the lowest pH (5.96 ± 0.16) rather than other two groups (Fig. 3A, B). Clay, silt, and sand contents were similar among the three groups (Fig. 3C). Soil moisture content was also the highest in P. latifolius dominated quadrats (26.1 ± 1.7%), and P. australis dominated quadrats (24.0 ± 2.0%) and P. latifolius and P. australis co-dominated quadrats (20.8 ± 0.9%) were followed (Fig. 3D). Soil organic matter content was similar among the three groups. Soil PO4-P content was the highest in P. latifolius dominated quadrats (PO4-PPL = 13.0 ± 1.7 mg kg−1; PO4-PPA + PL = 6.8 ± 0.6 mg kg−1; PO4-PPA = 8.7 ± 1.3 mg kg−1; Fig. 3E). Soil NH4-N and NO3-N content was similar among the three groups. Soil sodium content was the highest in P. latifolius dominated quadrats (PL = 2619 ± 230 mg kg−1; PL + PA = 1219 ± 738 mg kg−1; PA = 1301 ± 439 mg kg−1), which showed similar pattern with soil electric conductivity (Fig. 3F). Other exchangeable cation contents (K+, Ca2+, Mg2+) were similar among the three groups. Redundancy analysis showed that soil environmental characteristics of P. latifolius dominated quadrats and P. australis dominated quadrats could be separated by ordination (Fig. 4a). P. australis dominated or P. latifolius and P. australis co-dominated quadrats showed the higher pH or calcium content than P. latifolius dominated quadrats, while they were characterized by the higher soil ion contents caused by saline water. From the results of the field survey and ordination, generalized zonation pattern could be described as [S. japonica] – [P. latifolius] – [P. latifolius and P. australis] – [P. australis and other land plants] from the relatively lower to upper tidal zone (Fig. 4b). Soil environmental characteristics of P. latifolius and P. australis dominated quadrats were similar to P. australis dominated quadrats rather than P. latifolius dominated quadrats, whereas the environmental characteristics of P. latifolius and P. australis co-dominated quadrats were varied. P. latifolius dominated quadrats showed higher electric conductivity, soil Na+ and PO4-P content and lower Ca2+ content than P. australis dominated or P. latifolius and P. australis co-dominated quadrats. Soil environmental characteristics such as soil salinity, total nitrate, and clay content of P. australis in tidal marsh were significantly lower than the soil environment of Suaeda community in lower area (Lee et al. 2016, 2018). Overall soil pH, electric conductivity, and other exchangeable cation concentrations were lower than the previous studies on the tidal marsh (Ihm et al. 2007; Lee et al. 2016). Plant community and soil of the studied tidal channel seemed to likely be classified as estuaries, which affected by seawater tide and freshwater output. Not only the tide affected the soil environment of zonation between P. australis and P. latifolius, but also the freshwater input seemed to affect the soil. In the present study, soil environmental characteristics of P. australis and P. latifolius did not show the difference in soil nitrate content or particle content. According to the narrower difference in soil environment, distribution range of P. australis and P. latifolius seemed to be restricted and almost overlapped only in the upper tidal marsh (Yokoyama et al. 2003; Bang et al. 2018). Despite the overlapped distribution ranges by elevation of P. australis and P. latifolius (Bang et al. 2018), the co-existence range was narrower in this study. Min (2015) showed that P. australis and P. latifolius could co-exist in same tidal mound without the belowground competition by rhizome of P. australis which rooted deeper than P. latifolius. It has been reported that P. australis could inhabit in tidal marsh and even thrive when freshwater inflows (Lissner and Schierup 1997; Hong 2015). In spite of that, P. latifolius could exist in the more upper tidal zone than P. australis (Yokoyama et al. 2003; Bang et al. 2018); P. latifolius could not outcompete P. australis at the upper tidal zone in this study. Plant growth in the lower tidal zone is mainly restricted by saline soil than interspecific competition, whereas interspecific competition is major in the upper tidal zone by reduced environmental stress (Crain et al. 2004). Therefore, it could be supposed that competitiveness of P. latifolius is stronger in relatively lower tidal zone by active salt excretion mechanism, whereas P. australis is competitive only in the relatively upper zone where the effect of seawater is weak. Soil salinity, which is represented by the electric conductivity, and soil pH were the key factors that determine the distribution of P. australis and P. latifolius. 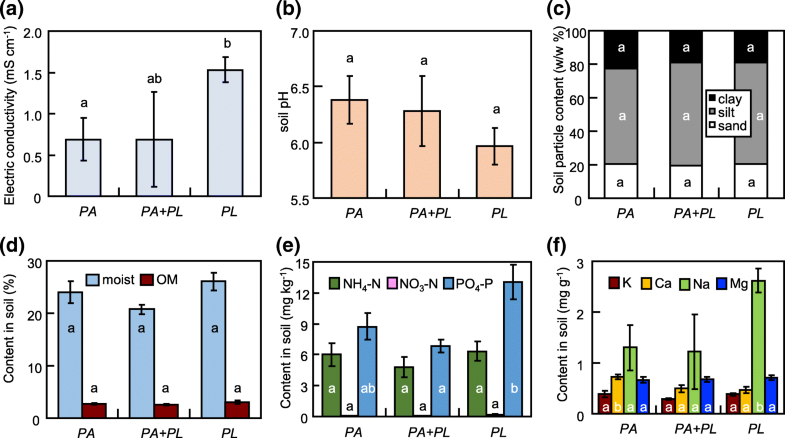 Regardless of that P. latifolius inhabited in the relative saline soil environment than P. australis, soil electric conductivity and pH range of P. latifolius dominated habitat were narrower than those of P. australis dominated. Considering that P. australis dominated habitat consists of terrestrial plant species, zonation of P. latifolius and P. australis seemed to be a transitional zone between halophytes and land plant species. Our result could provide information of the soil environmental range of large macrophyte vegetation in the salt marsh restoration. This research was supported by the Basic Science Research Program through the National Research Foundation of Korea (NRF) funded by the Ministry of Education (NRF-2015R1D1A1A01057373), the National Research Foundation of Korea (NRF) grant funded by the Korea government (MSIT) (NRF-2018R1A2B2002267), and R&E program of Siheung Education Institute for Gifted. BEN participated in the design of the study, field survey and sampling, environmental analysis experiment, and data analyses and wrote the manuscript draft. MGH participated in the design of the study, field survey, and data analyses and edited the manuscript draft. HJP participated in the field survey and sampling and environmental analysis experiment. JGK conceived the study, participated in the design of the study, edited the manuscript draft, and secured the funding. All authors read and approved the final manuscript.